Name, age, hometown: My name is Osman Francisco Hance (but everyone calls me Cisco), I am 19 years old, and I currently live in Port Saint Lucie, Fla. What corps are you in and what is your role this summer? I am a member of Carolina Crown , and this will be my second year as center snare and battery section leader. Where I go to school and what I'm studying: I am currently enrolled school at Indian River Community College and I am a music education major. 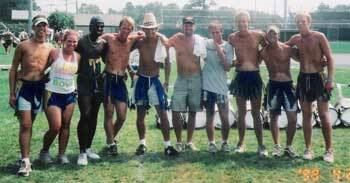 The 2005 Carolina Crown snare line on finals day. Left to right: Bradford Ralston, Melinda Leoce, Mustafa Saveur, Kenny Kominic, Luis Rivera,Brian Tinkel, Me, Any Jeffries, Justin Mabry and Matteous Schmouter. Give us your full drum corps/marching music background. I began my drum corps experience when I was 16, when I auditioned for The Magic of Orlando in 2003. In '03 I marched bass, I came back in '04 and was on the snare line. In 2005 I then went to audition for Carolina Crown and received the position of center snare and battery section leader. What's your practice schedule like? My practice schedule is basically whatever free time I have. During school I am in the studio for a couple of hours a day, then I usually come home and get the practice pad out. I usually go at it on the pad for a few hours at a time, not realizing it. What does your ideal free day consist of? As much sitting as possible. Most people like to get up and walk around on their free days. I say that we don't get many chances to just sit, so if we go to a mall, I like to find the nearest Brookstone and sit in a massage chair for as long as it takes for the manager to kick me out. Favorite pig-out food: My favorite pig-out food would have to be Cheeze-its. Any flavor, I like them a lot. In the shower you can hear me singing: I understand that I have a horrible voice, that's why I play drums, so you don't usually hear me singing in the shower. I am on an "in and out" schedule in the shower. The last good book I read: "Philosophy for dummies" by Tom Morris. The last great film I saw: It's hard to call a film great. I guess "Ray" was a good one. I also like the final "Star Wars." Jobs I have/have had: Jobs that I have had include working at Subway, Cici's Pizza and and Steak 'n' Shake. I was also a boat detailer. I also have taught drum lines at West Boca High School in Boca Raton, Fla. I currently teach the percussion at Jensen Beach High School, and I am the snare technician at Paradox Percussion Theater Independent open winter line. My favorite TV show: My favorite TV show is "Seinfeld." What has been your formative drum corps moment? My one formative moment, that formed my love for drum corps, would have to be 2003 at Magic of Orlanso. Finals retreat when they put the medal on me, I finally saw a look of approval on the faces of my instructors. I remember my bass tech telling me to turn around, and behind me was my very first drum instructor. It made me realize how far I had come, from being the only freshman on my high school line not really knowing much about drums, to marching a top-12 drum line in front of thousands of people. All of the sweat and hard work was then paid off with the face of approval from all of those who showed me the way. What would you be doing next summer if you were not marching? If I were not marching I would be teaching all summer. How did you decide to be a member of your corps? Last year about a week before the Crown camp began, I heard that Brian Tinkel was the caption head, so I immediately cancelled all of my other plans to audition elsewhere and went to Crown. What first attracted you to the drum corps activity? Haha. My junior year of high school, a friend and I were really into drum corps. We loved finding music online and playing it. We wanted it so badly, but our percussion instructor told us that we were not good enough to ever make a drum corps. That same year I made the Magic Of Orlando. What advice would you give to young people who want to march? First and foremost, don't be afraid to audition. Even if you don't make it, you get the experience and the upper leg on the next year's audition. Secondly, love it, this is not an activity you can survive if you don't love each and every second. What I want to be when I "grow up": I think I have found my calling as an educator. Though I love to perform, my first time watching a group of my own students take the field, I got a feeling that nothing else can produce. Best drum corps show ever and why: I would have to say Star of Indiana 1993. The show is one of a kind. Besides the fact that it is my favorite percussion section ever, the musicality along with the visual concept was amazing. The year is 2030. What does a DCI show look like? Haha, floating drums? Just an item on the wish list. I honestly hope that there aren't many changes. I am a guy that likes the classic music and marching and that's all of the effect you need.